Star Realms Strategy! | The best site for Star Realms Strategy! Long before I began playing Star Realms, I played an unhealthy amount of Magic: the Gathering. It has always been my favorite thing to counter a spell and shut people down. I could never actually finish someone off with aggressive decks, and they were lacking in choice and card advantage. I’ve always loved to draw extra cards and to come back from behind. So, it’s no surprise that I lean towards blue/red decks in Star Realms, with lots of bases. For a long time, I didn’t touch green cards if I could avoid it. Furthermore, back in the days before Colony Wars, what is now “top row” was the “big deck” format for a very long time. I felt very confident in that format, and still believe that the top-tier deck is one revolving around bases/scrap/life gain, and that aggro decks are considerably weaker. This entry was posted in Strategy and tagged Colony Wars, convoy bot on October 12, 2018 by Derek Thompson. This episode is dedicated to an exclusive interview with Ola “Dommola” Mæhle who recently became the first player to reach level 100 in the digital Star Realms Game. We cover his accomplishment, but also his broader gaming background and his key tips for new players. This entry was posted in Podcast, Strategy on February 18, 2018 by dclingman. This entry was posted in Podcast on January 28, 2018 by dclingman. Happy Holidays and thanks to all of our listeners in 2017! This was an incredible year and here’s to a great 2018! This entry was posted in Previews, Strategy on December 31, 2017 by dclingman. 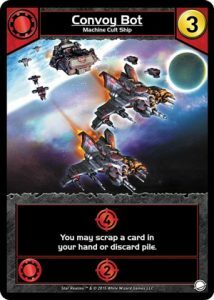 For better or for worse, Star Realms is not the game it was upon release, and I don’t just mean that there are more ships and bases. The original core set was a fantastic deck-building game, but an inherent feature of its gameplay was a considerable slowness to the feedback loop. What I mean by that is, when you purchase a card, it usually takes at least a turn (if not several) for it to show up and do anything of use. The basic exception would be buying a card and then forcing a shuffle; the only other exceptions in the core set are Freighter, Central Office, and Blob Carrier, and those require some combination of ally effects and card draws to have immediate effect. This entry was posted in Guides, Strategy and tagged bigdeck, events on December 8, 2017 by Derek Thompson. These four cards are good in almost any deck, regardless of factions. Everyone knows factioning is good. If you can stick to buying one or two colors you are more likely to play them together and get their faction bonuses, thereby increasing the efficiency of your cards and the effectiveness of each turn. In an ideal world, you can choose which cards would be available for you to buy ahead of time to maximize this strategy, while keeping your opponent from maximizing theirs. In this world, however, the trade row and your opponent don’t always cooperate with you so you must think more flexibly and adapt to changing circumstances and create cohesive decks not just based around factions but around what the cards actually do and when they will be played. While factioning can provide useful bonuses throughout the game, the real key to victory is purchasing cards for their primary ability in time to be played in the phase of the game where that ability is most useful and by purchasing cards that fit your deck archetype and counter your opponent’s archetype. This entry was posted in Guides, Strategy on December 5, 2017 by bradelkey.